As you might have already heard, the Pixel 2 and Pixel 2 XL don't have headphone jacks. It's disappointing, yes, but Google has a solution if you need to charge and listen to your tunes at the same time. The only problem: it's a $44.95 solution, and you'll have this giant dongle hanging off of your shiny new phone. This isn't the first time we've seen an adapter of this nature for a phone; similar ones exist for the iPhone 7. If you want to charge and listen to music over wired headphones at the same time, this one, made by Moshi, is pretty much your only option. At least it looks nice, with its aluminum construction and reinforced connector areas. But at $44.95, it might just be worth it to buy a new set of Bluetooth earphones for this purpose alone, unless you're just extremely averse to Bluetooth's sound quality. It's worth noting that a regular USB-C to 3.5mm adapter comes in the box of every Pixel 2, and new ones can be purchased for $20. 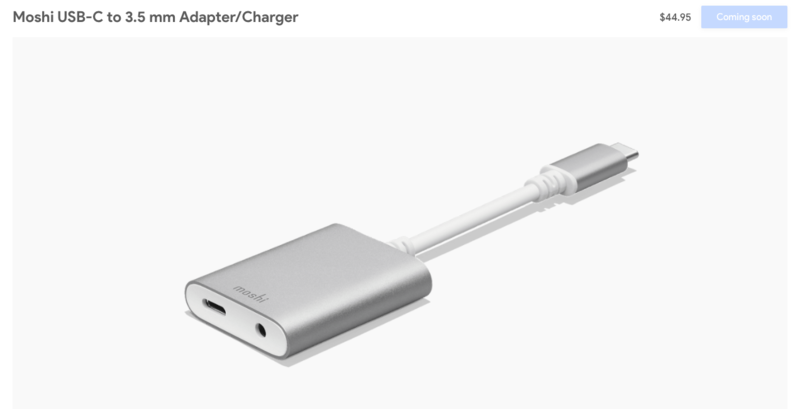 From a quick look on Amazon, there are a few USB-C to 3.5mm/USB-C adapters that are supposed to accomplish the same thing, but they're all between $8 and $15 and have horrible reviews. You can wait for more reputable third-party manufacturers to make some, but if you're impatient and just have to have your music through wires while juicing your phone up, here you go.